Indian Polity - भारतीय राजव्यवस्था Notes PDF: Today, I am going to share a useful PDF of "Indian Polity Notes". 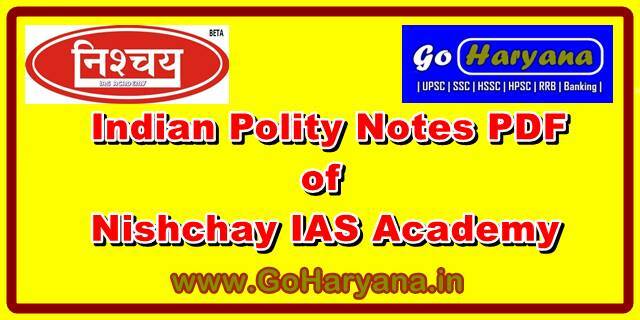 Indian Polity is the most important topic for UPSC, SSC and All PCS Exams. The questions are normally asked in the UPSC Preliminary (Paper-I) and Mains (General Studies-III) from Indian Polity. We are share Indian Polity Notes PDF by Nichay IAS Academy. This file boost up your preparation of UPSC, CGL, PCS and all other competitive exams.